Coffee reached Europe in the second half of the 1600’s and Venice was one of the first Italian cities that experienced the coffee aroma. As it spread throughout the whole Peninsula it soon became a benchmark for fashionable Italians to be seen in the coffee houses. Venetians were the first to learn all about this beverage, both for its characteristic good taste, but also as they thought at that time to take advantage from its medicinal and digestive properties. From Venice, the coffee rapidly spread throughout the european continent, becoming loved by the Italians and other nationalities. Northern Italy and the city of Venice became the epicentre of coffee production and became the bridge between east and west, by importing and transforming an eastern beverage into a western coffee..
Magazzini del Caffè SpA was established in 2003 with the express intent of distinguishing itself as the sole Italian roasting company directly overseeing all processes and production stages of production, from coffee cultivation in Brazil to blending, roasting and packing in their factory in Italy. The total control of the coffee production, processing and supply chain must be regarded as the best guarantee for maintaining the highest quality constant over time. In fact, the hands-on management and control during all cultivation, production, selection of the green coffee, roasting and packaging stages, ensure the highest possible quality standards. The constant and significant growth in business volume reflects the worth and validity of the Company’s fundamental choices and activities undertaken in pursuance of its mission. Slow roasting and 90 years of experience come together to give the exceptional flavours of Carraro Coffee. Our company has been on a quest for quality since 1927. We combine the culture and taste of great master roasters with cutting-edge production technology. The resulting coffee is an absolute delight to savour, with an aroma that gets more and more refined with every harvest, year after year. Caffè Carraro is built on all of this. However, there are more than just slogans to this “taste” approach. For us, quality means daily routine, work and selection. Selection of the best origins for supplies of ingredients, selection of blends, selection of coffee processing methods and selection of partners. An enthusiastic approach to work, knowing that you do it well and constantly striving to improve. 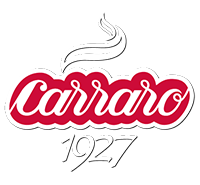 These are the values that have made Caffè Carraro into the successful coffee roasting company that it is today. To see how your capsules are produced a video will be seen here shortly.